TEAM SPIRIT creator Barry Heermann is the author of a new McGraw-Hill book, Building Team Spirit: Activities for Inspiring and Energizing Teams. The book is a practical guide to creating spirited teams. The initial chapters provide context for spirit in team and organization, describing the modes of thinking from which TEAM SPIRIT arises, the Spiral, the harmonics, and the surrounding theoretical framework. The remaining chapters include dozens of team activities great for lighting a fire under a new team, or boosting morale and enthusiasm in an existing team [from McGraw-Hill sales materials for this volume]. 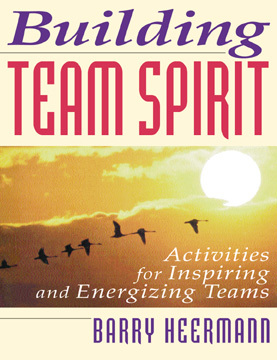 Building Team Spirit: Activities for Inspiring and Energizing Teams is available in two formats: a soft-cover version for $39.95 and a loose-leaf, hard cover format edition for $89.95. 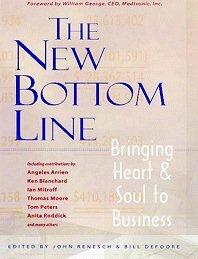 TEAM SPIRIT creator, Barry Heermann, is one of a series of authors featured in the book The New Bottom Line: Bringing Heart and Soul To Business. This compendium of perspectives is edited by John Renesch and Bill DeFoore. The book addresses the questions, What is this quest to find the soul of business? Why are so many people going through spiritual crises at work? Barrys chapter, Spirit In Team, examines factors related to high performing, spirited teams. This compendium includes a variety of pertinent articles on heart and soul in business. The book treats the debate between Tom Peters and others who make the case for spirit in organization, and it features Angelis Arien, Thomas Moore, Anita Roddick, and others who address spirit in the workplace themes. The book is priced at $33.95.